We apologise that there is not yet a translation available for this product. Take longer vacations without worry. Keep your garden "topped up" at all times. Water less often. 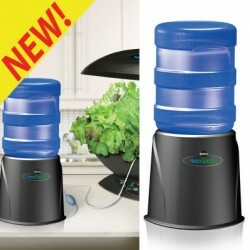 The new AeroVoir AeroGarden Reservoir is water without worry. It’s already a breeze to water your AeroGarden - especially because it reminds you to. But as plants mature they use more water. The AeroVoir sits next to (or behind) your AeroGarden and automatically keeps your garden filled to ideal levels. Use it for longer vacations without worry. Or use it because it makes watering even easier. Your plants will love the back up! Adds up to 2 additional weeks to watering intervals, up to 4 weeks total! Works with all AeroGarden models.